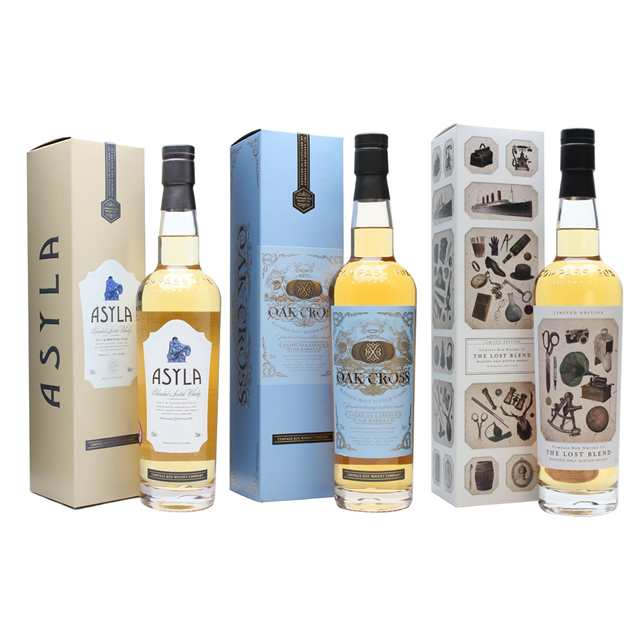 Asyla A blend of soft, fruity malt whiskies on a bed of rich, sweet grain whiskies. All whiskies aged in first-fill American oak casks to yield the trademark Compass Box style: soft, rich, vanilla-tinged, delicious. See why this, the lightest of our whiskies, wins the most awards! Sweet, delicate and very smooth on the palate, with flavours of vanilla-cream, cereals and a subtle apple like fruit character. Ideal as an aperitif served in a white wine or similar glass with chilled water to taste. Try before a meal with shavings of Parmigiano Reggiano. Single malts from the towns of Alness and Longmorn; single grain whisky from Fife. 100% first-fill American oak ex-Bourbon. Bottled at 40%. Not chill filtered. Natural colour. Oak Cross We call this whisky Oak Cross because it offers the best characteristics of both American and French oak aging. A rich, medium-bodied blended malt Scotch whisky, Oak Cross combines vanilla characters from American oak and spicy, clove-like characters from French oak. Suitable as an aperitif served with a chilled water in the winter months. Full enough to serve as a summertime digestif. Excellent match for many cheeses. Made entirely of Highland single malt whiskies from the villages of Brora (fruitiness), Carron (meatiness) and Alness (perfume). All the whiskies are aged for their primary maturation in a mix of American oak cask types. The marrying casks are a mix of first-fill Bourbon barrels and our proprietary “Oak Cross” casks made of American and new French oaks. Bottled at 43%. Natural colour. Not chill filtered. The Lost Blend In 2001, we created our first single malt blend which we called Eleuthera. It was an elegant and simple blend of approximately 80% unpeated Highland and 20% peaty Islay single malts. Alas, after 3 years, we were suddenly no longer able to obtain one of the key whiskies required for the recipe so, sadly, we retired Eleuthera in 2004. Quietly, I have always been looking for whiskies that we could use to bring it back, even if temporarily, but not with any luck. Until now. A limited edition of 12018 bottles. An elegantly complex union of two fruity Highland single malts and a peaty Islay single malt. An ethereal fruit and herbal character and a sweetness on the palate is buttressed by an underlying smokiness. We’ve created three different front label designs all around the same theme: lost items. The whisky behind each label is the same, and the three labels have been randomly bottled and put into cases, which allows you an additional discovery to the whisky itself: which label did I get?